Do. Do Differently. Don't Do. Ahhhh..... this is me. Real time. 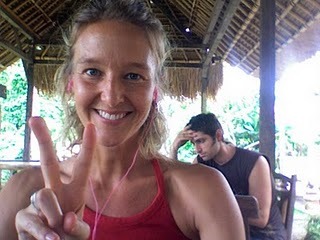 Sitting in "Lil K" below the Yoga Barn... getting ready to head up to teach Yoga. A quiet morning of journaling, drinking green juice, eating scrambled eggs, and listening to Jana Stanfield's new CD. Last night we went to dinner with Jana and her partner, J. It was lovely. Realizing how each moment we are given opportunity after opportunity to feel the sunshine, regardless of what moves between where we are and the sun. The Title of this blog: Do. Do Differently. Don't Do. This is a loose translation from ancient yoga texts, and it is something I am practicing to embody. Each moment, when the sun is not penetrating my heart, I have these choices: Do (as I have done... if it is working). Do differently. (If it's not working and I have ideas or room to make a different choice). Or let go, and simply don't do. "Say so long to the way you used to think before. Say good-bye to the way it used to be. There is a new world waiting. Open up your day to the rest of your destiny. Say 'yes' to the rest of your destiny, it's all for the best. To be blessed with the rest of your destiny." Off to teach yoga... at 10 pm at most of your homes.